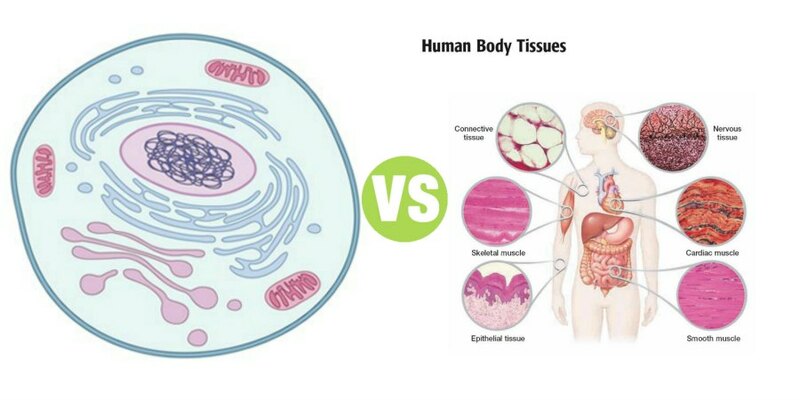 Summary: Difference Between Cell and Tissue is that cell is the smallest unit that has all the characteristics of life. Cell is defined as the structural and functional unit of the living body. While Tissue is defined as the group of cells having similar function. All the living things are composed of cells. A single cell is the smallest unit that has all the characteristics of life. Cell is defined as the structural and functional unit of the living body. Produces its own energy necessary for its growth, repair and other activities. Eliminates carbon dioxide and other metabolic wastes 4. Maintains the medium, i.e. the environment for its survival. Shows immediate response to the entry of invaders like bacteria or toxic substances into the body. Reproduces by division. There are some exceptions like neuron, which do not reproduce. Connective tissue (connective tissue proper, cartilage, bone and blood). Muscle mass or muscle tissue is made up of a large number of individual muscle cells or myocytes. The muscle cells are commonly called muscle fibers because these cells are long and slender in appearance. Skeletal muscle fibers are multinucleated and are arranged parallel to one another with some connective tissue in between.